Ever push your chair away from your desk, stretch your arms up in the air and go “I could really do with a massage”? Not just us? Didn’t think so. Whilst there are many little massage parlours dotted about the capital that it Is possible to duck into for a quick lunchtime massage, from our experience, these lovely independent high street venues rarely offer a serene or luxurious setting. So, what can you do if you’re a city worker stuck in Canary Wharf, dying for someone to rub your aches and pains away in a calm and comfortable environment? Sated has discovered a little-known pocket of bliss and tranquillity in this concrete jungle in the form of the Treatment Suite at Canary Riverside Plaza. 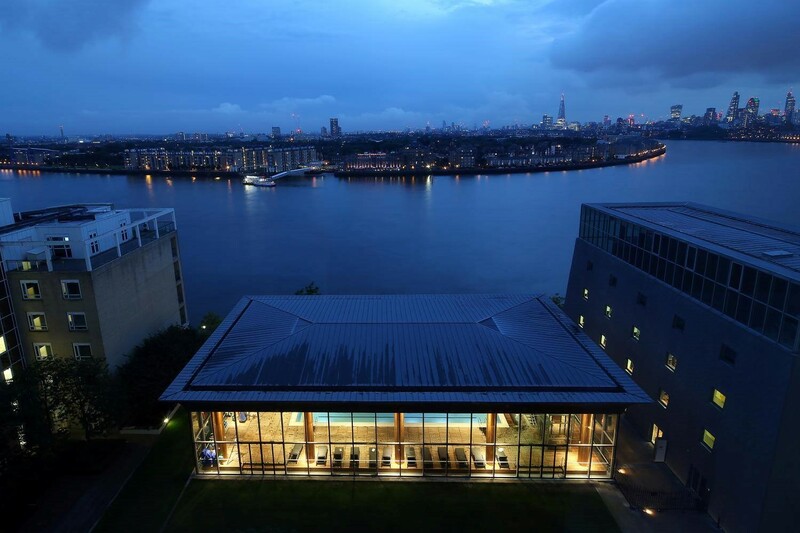 Located in the 5-star Canary Riverside Plaza Hotel overlooking the Thames, the Treatment Suite is a generously sized converted suite on the second floor of the building comprising a welcome reception room furnished with comfortable outdoor style seating, a treatment room large enough for couples and a full en-suite. 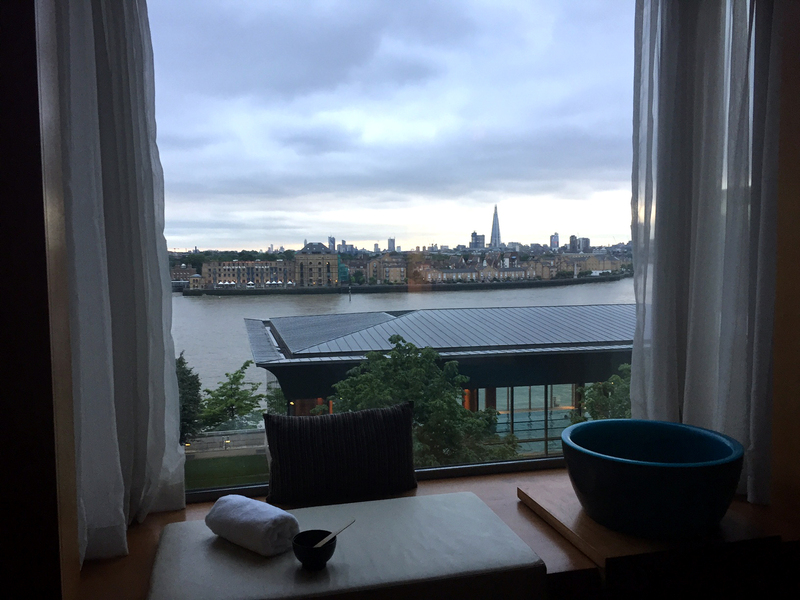 Whilst at first it admittedly feels a tad odd to be in what is essentially a guestroom in a hotel, our wonderful masseuse Rasa relaxes us into the setting, offering us a drink and talking us through the River-View Signature Ritual. Once we have decided on our music, scented oil and massage pressure, she leads us through to the treatment room, pointing to the bathroom and asking us to take out time to get changed before stepping out of the room to give us privacy. We take the opportunity to have a look around the space, appreciating the soft and editable lighting, comfortingly textured wooden floor and warmly minimalist décor. The real selling point of the suite however is the view out of the large window over the Thames looking towards the City. Sadly, today is a grey one but the panorama is still a spectacle. We stop being nosey and duck into the bathroom to change into our dressing gown. Disposable underwear is provided for those who wish to use them but is not by any means mandatory. Once robed, we take our seat in a cosy armchair facing the window. Rasa positions herself in front of us and begins the treatment with a nourishing foot scrub and deep acupressure foot massage. This proves to be just what we need to begin to relax and we quickly find ourselves sinking into our chair and losing ourselves in the calming view. Our feet are rinsed in warm water and dried before we are directed to the supremely comfortable bed where our full-body massage commences. Rose and Jasmine oil from The Organic Pharmacy is soothing without its scent being overpowering. Halfway through the treatment, heated stones are placed on our backs and moved around to alleviate tension and calm both the body and brain. Once completed, Rasa performs a head and scalp massage – you can elect not to have this or for no oil to be used if you have to go straight back to work and don’t have time to take a shower or bath in the en-suite. She leaves us to gather ourselves and we reluctantly drag our languid limbs from the bed. However, once we have forced ourselves vertical, we feel peaceful and deeply energised. We get dressed and Rasa accompanies us down to the Lobby where we are granted a sneak peek at the glass box Virgin Active gym accessible to the hotel guests and made famous by a scene in James Bond’s Skyfall. We drift out of the hotel feeling entirely relaxed and ready to face the hustle and bustle of London once more after our wonderful little oasis trip. 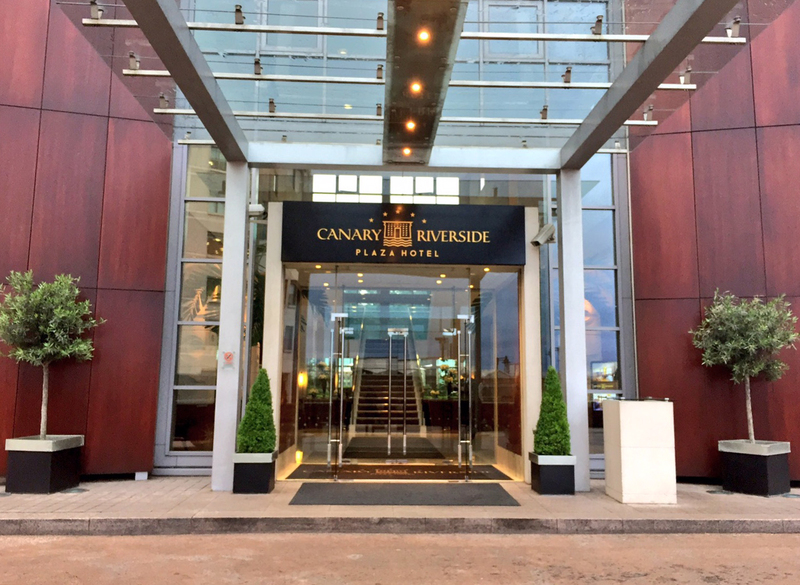 Whilst not a destination spa in itself by any means, the Treatment Suite at Canary Riverside Plaza is most definitely a welcome respite for those working nearby, attending a conference or staying at the hotel. 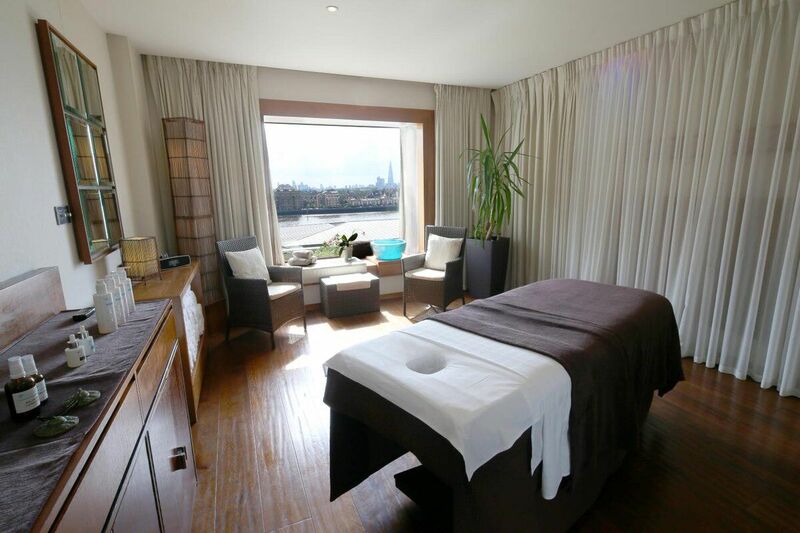 The River-View Signature Ritual lasts for one and a half hours and costs £140. A Couples River-View Signature Ritual lasts for the same duration and costs £310. Other treatments include facials, massages, manicures and pedicures. A full list of options available can be found here.